On April 4th, three teams of students competed at the Widener University programming competition. 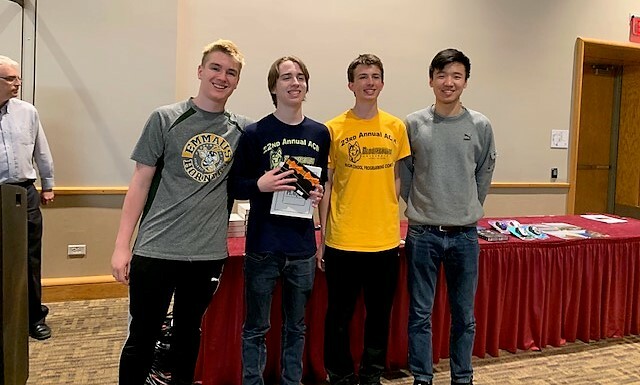 The team of Frankie Hughes, Mitch Machulsky, and Arti Schmidt successfully solved all eight programs, earning second place out of over fifty teams. On Tuesday, April 9th, Cindy Brashear and Beth Stoudt took eight teams of four students each to compete at the 24th annual Bloomsburg University programming competition. Students were there three hours to solve ten programming problems. The team of Frankie Hughes, Patrick Kuzdzal, Johnny Yang, and Arti Schmit took second place out of fifty-four teams. The team of Nathan Bowler, Ben Brown, Ethan Knode, and Dalton Leight were a close third place. The only difference was the time to complete seven programs. The team of Matthew Magee, Srijan Ponnala, Geoffrey Kleinberg, and Ben Zientara took fifth place.